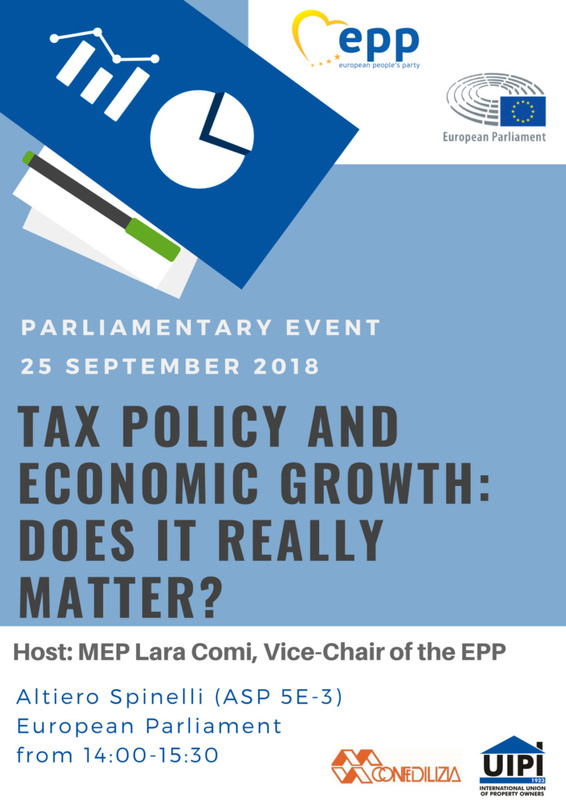 On 25 September 2018, the International Union of Property Owners (UIPI) and its Italian member association, CONFEDILIZIA, co-organised an event at the European Parliament to bring new insights into the debate on fiscal policy and economic growth. Current discussions on tax policy are focusing on optimising economic growth. Leading research in the field argues that growth-friendly tax structures require a shift of tax burden away from labour onto other types of taxation, which are meant to be less harmful to growth and employment, such as on consumption, environmental or recurrent property tax. This is the approach implied by the European Commission when analysing taxation policies across Member States and their impact on their macroeconomic performances within the European Economic Governance framework. Yet, is it that simple? Fiscal policy is a complex matter and the lack of sufficient data in this context makes it difficult to draw robust conclusions. Hosted by MEP Lara Comi, this event brought together several Members of the European Parliament, major European real estate stakeholders as well as prominent researchers from the academic world. Yesterday’s discussion focused on the results of a recent empirical study questioning the robustness of the correlation between revenue-neutral tax shifts and economic growth, which was conducted by Professor Riccardo Puglisi from the University of Pavia (IT).